The minimum requirements for any faculty appointment are almost invariably a master’s degree and a minimum of eighteen graduate hours in the area of instruction. In exceptional cases, equivalencies may be determined on the basis of unusual circumstances at the discretion of the Chief Academic Officer with concurrence from the President. Such arrangements will be delineated in writing at the time of the faculty member’s hiring, and documentation relating to the arrangement will be maintained in the faculty member’s professional file on deposit with the College, as well as by the Dean of Faculty’s office. Teaching faculty, whose original employment by the College is certified by the Board of Visitors, receive annual performance reviews from their department chairs and the Chief Academic Officer. If promotion in rank is at issue, subsequent Board approval of that change in status is required. Discontinuance of a program or department of instruction. The burden of proof in establishing cause for dismissal rests upon the institution. The standard of proof is preponderance of the evidence. When a tenure-track faculty member joins the faculty of Richard Bland College, an initial, probationary appointment for a specified period begins, at the conclusion of which the appointment expires unless reappointment is Reappointment is also for a specified period, and likewise expires, unless renewed. No faculty member has any rights, real or implied, to appointment or reappointment during the probationary period. A faculty member is evaluated for tenure in the fall of the sixth year of full-time employment. The Chief Academic Officer is responsible for notifying faculty members for whom a tenure review is. Notification should be made during the spring semester preceding the review. At that time, candidates should also be informed of the members of the Peer Review Committee. In case a faculty member is not informed by the Chief Academic Officer, the member should contact the Chief Academic Officer concerning his or her eligibility. In exceptional cases, early eligibility for the tenure review process may be granted by the Chief Academic Officerwith concurrence from the Explanation in writing of the exceptional case will be provided to the Peer Review Committee. Full-time, tenure-eligible service only, in any rank, from instructor to professor, or any combination of ranks, will count towards However, tenure will not be accorded those below the academic rank of assistant professor. Faculty members on leave, with or without pay, may gain credit toward tenure or consideration for multiple-year appointments, if such leave is approved by the Chief Academic Officer. 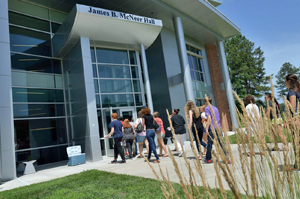 Richard Bland College is administered under a July 1 – June 30 fiscal Faculty who serve a twelve (12)-month appointment will be considered to have served a full year if they commenced duties by July 1, and faculty under academic-year appointment only if they serve the entire academic year. Fractional years of service may not be combined into one or more whole years in the computation of probationary years of service. Full-time teaching/research experience at the rank of instructor or above at any other accredited institution of higher learning will be credited towards the above tenure probationary. The individual may be required, however, to serve a probationary period of as much as four (4) years at Richard Bland College before tenure is granted, even if the total full-time service exceeds seven (7) years. The terms of such a probationary period will be stated at the time of initial appointment, both in the letter of offer and in the final written appointment letter. Failure to comply with laws or state or College policies. A specified-term appointment terminates on the date specified in the appointment letter. This arrangement may be granted for periods up to five (5) consecutive years. The first year of employment for specified-term teaching faculty. After the initial appointment, the faculty member shall be evaluated, and may be recommended for reappointment of one (1), three (3), or five (5) years. A one-year appointment shall be for one (1) year, and may be renewed annually. Multi-year appointments shall be for three (3) or five (5) years’ duration. Only specified-term teaching faculty who are employed in unrestricted full-time appointments, and who have been recommended for reappointment, are eligible for three (3)-and five (5)-year appointments. Neither a three (3)-year appointment nor a five (5)-year appointment will be affected by change in faculty rank. No specified-term full-time faculty member shall be eligible for a three (3)-year appointment until the completion of three (3) consecutive one (1)-year appointments, including the initial appointment. No specified-term full-time faculty member shall be eligible for a five (5)-year appointment until the completion of a three (3)-year appointment. Appointment and reappointment decisions shall be made subject to all other provisions of this policy and at the sole discretion of the President. Nothing in this policy is intended to limit the number of one (1)-year and three (3)- year appointments that may be granted, nor shall this policy prohibit the granting of a shorter appointment to a faculty member who previously held a longer-term appointment. Specified-term teaching faculty should not have expectation of employment beyond the end date of a current appointment unless reappointment is issued. Each appointment is only for the duration stipulated in its contractual terms, which ceases on the end date specified, unless reappointment is offered. Unless it is determined by the President in his/her sole discretion not to be in the best interests of the College, the following notice periods will be observed. In the case of one (1)-year appointments, notice of non-renewal of the appointment contract shall be given by March 1 of the first contract year; by December 15 of the second contract year, and twelve (12) months before the expiration of the third contract year. For three (3)-year and five (5)-year appointments, notice of non-renewal of the appointment contract shall be given at least twelve (12) months before expiration of the final contract year. In cases of inability or failure to give notice by the required date, the College may meet this requirement by providing advance notice commensurate with the period in question. Qualified individuals may be appointed to part-time, short-term (generally one (1)-semester) contracts to provide instruction in specific courses. Adjunct faculty members do not qualify for benefits. Time served as an adjunct faculty member does not accrue toward tenure, and tenure cannot be awarded at this rank. Upon recommendation of the President, and following completion of ten (10) or more years of full-time, continuous service and retirement under the statutes of the Commonwealth of Virginia, retired members of the faculty will be awarded the rank of emeritus/a. Professors in the ranks of assistant, associate, and full professor who receive emeritus/a status will be awarded their respective emeriti ranks upon retirement. Additionally, academic administrators who retire with a record of exceptional service and meet these criteria will be considered for emeritus/a status. Emeritus/a standing at Richard Bland College includes the following privileges: ID card, parking decal, library privileges, email account, and inclusion in all faculty listings. The Chief Academic Officer will assess the need for additional faculty yearly and report such needs to the President. All full-time faculty searches must be approved in advance by the Dean of Faculty and President. This applies to searches for new positions, as well as searches for existing positions that become vacant. Once an academic department has received approval from the Dean of Faculty to search for a position, the department may begin the search process. Ordinarily, departments will receive final approval to conduct a search when the final budget is approved. Advertisement relating to the positions should be placed by mid- October, or within two (2) weeks of identifying a faculty vacancy (whichever date is later). Candidate campus visits and offers should be concluded as soon as feasible. Advertisements will be published or mailed to organizations, publications, and institutions on the list in the Richard Bland College AA/EEO Faculty Recruitment Plan. Applications postmarked through the published deadline will be processed according to criteria described in the advertisement and the AA/EEO guidelines. The AA/EEO officer will explain these guidelines to the search committee at its first meeting. The search committee is recommended by the Chief Academic Officer, and appointed by the President. It will review all applications for a vacant position using the Faculty Recruitment Evaluation Sheet provided by the Dean of Faculty. The search committee may employ telephone/video conference calls with each semi-finalist as part of the screening process. The committee will check the references given by the candidates who qualify as finalists in the search. 4. The search committee will present to the Dean of Faculty a list of not fewer than two (2) and not more than five (5) finalists, and a recommendation regarding which of these should be invited to the campus for an interview. A tour of the campus and the Petersburg area. After the search committee has reached a determination as to who are the best-qualified finalists for the vacant position, the credentials of the candidates invited to campus will be available in the Office of the Dean of Faculty for review by faculty and staff. Reactions to this and other public aspects of the review process may be provided to the search committee. If the Chief Academic Officer concurs with the recommendation of the search committee as to the successful finalist to whom employment should be offered, the name is forwarded to the President for review and a culminating decision. If the Chief Academic Officer does not concur with the recommendation of the search committee, s/he will inform the committee as to his/her reasons for dissent with the committee’s determination and request consideration of other candidates. If the search committee members continue to support their initial recommendation, written rationales for their separate determinations will be forwarded by the committee and the Chief Academic Officer to the President for his/her consideration. The President will have final authority on all appointments. A letter of intent to make an offer will be delivered from the President to the successful candidate. Expenses for the candidate’s/s’ visit(s) to campus (must not cover accompanying family members) will be paid in accordance with State guidelines and must not exceed an established figure set by the Chief Academic Officer and the President, and communicated to the search committee prior to arrangements made for candidates’ campus visits. The Chief Academic Officer will involve the appropriate department chair in the hiring of adjunct faculty, time permitting.